How is the rear seat room in this car? Can a six footer sit behind a tall driver with the seat adjusted back? I'm 6'6" and if I have someone in the back behind me I always bring the drivers seat up a couple of inches as well as the seat back. I wouldn't drive a long distance like this but there are very few mid-size cars that I know of that are any better. Best advice I can offer is take a tall friend with you and try it out to make sure. Both my wife and I are shorter (5'1" and 5'8") so there's no shortage of room in the back for tall people when we're hauling them around. But in general, my wife gives up the passenger seat to someone over 6'3" - just easier all around. The rear seat is exceptionally comfortable, or at least that's what our teenage daughter (5'4") says. But prpbably not the car if you're a family of tall people. 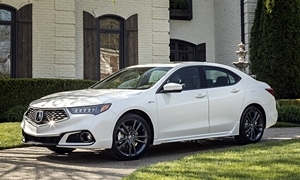 The TLX has the same cabin space as the TL before it. It's just a little shorter externally. I'm 5' 11" and cannot sit upright in the rear of a TLX at the autoshow. I wouldn't put someone back there that is close to my height.